You're invited to the opening reception of the November exhibit at the Old Bakery & Emporium art gallery. 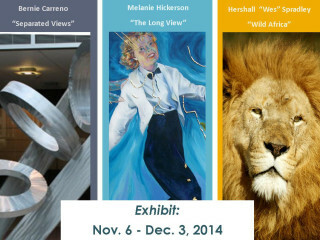 This month's featured artists are Bernie Carreno with cast metal art, Melanie Hickerson's Dream Motion in acrylic and Hershall Spradley's photos of wild Africa. The metal art is rarely seen and absolutely spectacular, the photos of African wildlife are spellbinding and they're all brought together with dreamlike acrylic paintings. The exhibit will run until December 3rd.